This entry was tagged Red telephone box, University of Wales, Writer, Writer Resources, Writers Resources, Writing, Writing Prompts. Bookmark the permalink. ← Does Your WIP Need A Bible? Ha! I thought maybe you were on vacation in London. Actually they are collectors items…so many people mourned their demise so bought them for their gardens or community. I have even seen a couple turned into tiny libraries! I don’t know if it applies here but in some places locals have campaigned to keep the actual box even when BT have insisted on removing the phone. I’ve seem (pictures of) them used as book exchanges. Kingston has a structure of these which is rather fun! Otherwise use them as a village library or similar. Really? That sounds interesting, like a kind of sculpture? Wow, that sounds brilliant Sam, did you take a pic? I saw one of these at an intersection in a tiny village in the Bahamas. I figured the empty ones were entrances to the Ministry of Magic. Is it just me or is the best answer for the use of a telephone box – other than as intended – is for individuals to change from their socially acceptable alter ego into their superhero costume? Bigger question is: which superhero/superpower would you have? Has to be Shapeshifting (I think that’s what it’s called) what about you honey? Anyway, my superpower? I’ve caught a few episodes of Charmed recently and I quite like the ability to freeze things…could come in handy I think. But, Shapeshifting: now there’s a story waiting to be told! I don’t have time for TV any more, but I was an avid fan of the original series—great story lines and hilariously bad special effects. R.E. nailed it and I was afraid nobody was going to catch it! It’s a TARDIS, obviously! I’m sitting here watching the Dr. Who marathon on BBC America in anticipation of the new episode tonight. Woo-hoo! And what did you think of the new episode? I LOVED it! The new episode was excellent! At first I was a little upset with the turn that Amy and Rory’s relationship had taken but I should’ve known it would all turn out alright!!! Are they rare now? 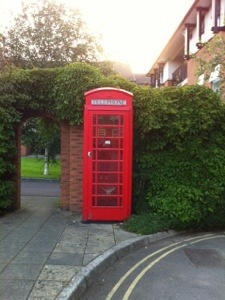 I remember when I was traveling through london in 2005 and saw the phone box. A bunch of my friends hopped in and took pictures. To change into my super hero costume obviously! I think when they were widely used they were red all over the country – like post boxes. – I’d be superwoman of course.